Today was the Salt City Royalty Fashion for Passion charity event to support the Juvenile Diabetes Research Foundation of Central New York. 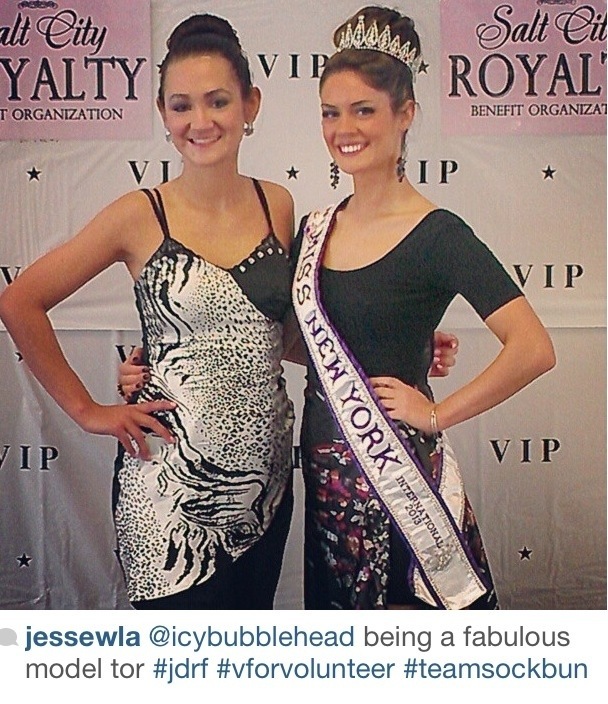 It was also the kickstart of Jesse Ladoue, Miss New York International’s V for Volunteer Tour. There were around 20 models throughout 4 categories. Kristy had asked me to model in the evening wear category. I chose to wear a cocktail dress that I had purchased for Miss Finger Lakes last year. In addition to the runway walks, there were also silent auction items for JDRF. Some great stuff was up for auction! Before the show, models could also take pictures with the VIP backdrop and the V for Volunteer backdrop. It was adorable as always! It raised over $200 for JDRF! I thoroughly enjoyed the “teamsockbun” hashtag, so thought it was worth saving when I cropped this photo from Instagram.